Voice over IP (VoIP) is a digital technology that allows voice and video calls to be conducted over an public or private IP network using a combination of computers and IP phones at both ends (as opposed to the PBX phone system using analogue technology to carry voice-only calls over a public or private telephone network using a combination of telephones and fax machines at both ends). Through the appropriate digital gateway, the digital IP telephony (IPT) System is able to communicate seamlessly with an analogue PBX phone systems over the analogue telephone network and vice versa.Based on the VoIP technologies, the IPT system not only allows voice, data and video to share the same network cable (hence reducing cabling and support cost), but also offers many features normally not found or cannot be implemented under the conventional PBX system such as broadcast or targeted delivery of digital news in voice, text and/or images. As such, the university has decided to gradually phase out the existing PBX system and adopt the IPT technologies in all new buildings and offices. The CityU IP Phone project started in 2002 by replacing in Festival Walk Office (FW) 300 phone lines subscribed from the commercial phone service provider with IP phones and installing 450 new IP phones in Phase I of the Student Hostel. In the Fall of 2003, another 140 phones in student rooms of Jockey Club House and To Yuen Building were upgraded to IP phones. Since 2004, the coverage of IPT has been gradually extending to new staff offices, public phones, and Phase II of the Student Residence. Up to now, we have around 6500 IP phones installed in the Student Residence, main campus and remote offices. The IPT system is composed of a Cisco Unified Communications Manager Cluster, a Unity Voice Mail System, a Fax Server, Voice Gateways and IP phone sets inter-connected through Cisco routers and switches. The IPT core equipments and core network are built with full redundancy and highest priority is given to voice traffic to ensure best quality and reliability. 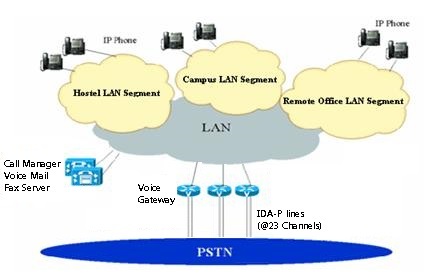 The following picture depicts the architecture of the IPT on the campus network. This web site aims at providing CityU members information of the CityU IP Phone Systems including quick reference of different models of IP phone handsets and features of phone services provided by the Computing Services Centre. IP Phones can be relocated to anywhere on the network without reconfiguration. Share cabling and management cost with the data network. Telephone number is associated with an IP phone, not a location. Can push message onto a single, a group, and groups of IP phones. Personal phone profile of an IP phone can be exported to and inherited by other IP phones. Seamlessly Integrate with WiFi and Video IP Phones. Enhance learning and communication by setting up highly-collaborative meetings, training sessions, and presentations using voice, video, or web conferencing provided by the IPT system. Able to access web information from an IP Phone using keypad or speech. Allow simple transactional requests (e.g., request for information) to be raised through an IP phone using keypad or speech. Remain reachable by having ubiquitous access to voice, email, and fax messages from an IP phone or a PC anywhere on the Internet. Much easier to cater for or meet future phone needs as the capacity of IPT system is scalable while “add and change” is easy.